Jackie Robinson: You want a player who doesn’t have the guts to fight back? 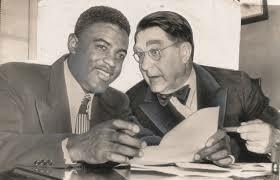 Branch Rickey: No. I want a player who’s got the guts *not* to fight back. 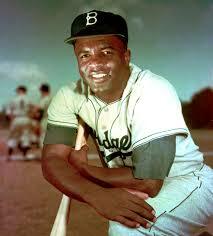 Jackie Robinson: You give me a uniform, you give me a number on my back, I’ll give you the guts. Last Night my wife and I went to see the new movie about the life of Jackie Robinson and breaking the baseball color barrier. I first heard about this movie last summer when I wrote this post about C.J. Nitkowski, then a pitcher in the Mets organization, who played the role of Dutch Leonard, a Phillies pitcher that Robinson bats against in one of the key moments in the film. Since hearing about it, I have been eager to see it. 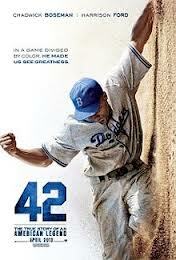 Now that I have, let me share my thoughts about the movie and the story of Jackie Robinson. Jackie Robinson faced abuse, mostly verbal but occasionally physical, from opposing players and even teammates. He faced taunts and insults from fans, unfair rulings from umpires and differential treatment from restaurants, hotels, restaurants, etc. And yet, he was largely resistant to what would be a natural instinct for all of us – to fight back, to get revenge. Robinson credits his faith in God as the source for his patient courage to resist returning “evil for evil”. And while the movie may not have had a montage of Robinson at church or kneeling in prayer at his bedside, the fact that he was able to endure so much and focus on doing and being his best can only be attributed to God working in him. I opened this post with an oft quoted exchange from the movie. That attitude is what is at the heart of Jesus life on earth,and his instruction to turn the other cheek. I thought the movie was spectacular. It was a sports movie that was about WAY more than sports. It was a 2 hour movie that moved along swiftly and left you ready for more. And mostly, it was a story of 2 men who changed the landscape of America’s National Pastime. And it is the faith in God of both men that led to this amazing change. That is what spoke to me, watching the movie last night – the risk that both men took to make this happen. For Robinson the risks were obvious – physical danger, insults, danger to his family, friends, increasing tension between races. But for Branch Rickey, there were also risks. Upsetting the balance of baseball – being shunned by the other business owners, death threats and insults. It was a risky move, but one he made knowing it would make his team, and ultimately the game better. 42 is an amazing story of a key time in American History. What the movie did for me, as a believer, was remind me that God forgave me and calls me to forgive others, even if they are vicious to me. The forgiveness he calls us to goes against our instinct to get revenge or fight, and teaches us as much or more as it will teach those we forgive. Let’s be ready to listen and learn as we live for Him, even when it is hard.